Having a vegetable today keeps the doctor away, right? As a child we were all told to eat our vegetables by our parents. And had they tasted better we would have happily eaten them. Veggies don’t have to taste like they came straight from the ground; they can taste heavenly! It’s all about what you put on them. Whether you add sugar, oil, cover everything in breadcrumbs or other delicious ingredients your vegetables can taste super yummy. It doesn’t take a lot of ingredients to make something that we despised as a kid into something that makes your taste buds shout out in celebration! Check out these amazing recipes to make eating vegetables enjoyable! Sweet, salty, and they take no time at all to make! This baby carrot recipe takes all the goodness of carrots and combines it with the salty sweetness that we all know and love. Eat them by themselves or as a side dish and they’re good either way. Definitely a hit for everyone! We all love parmesan on our Italian food, so why not on our broccoli too? This recipe adds a cheesy taste to those vegetables we used to avoid at dinner. Because many of us can agree that cheese makes everything better! This Italian tribute to summer vegetables will make your mouth water, and it won’t take you that long to make. All you need is a casserole dish and you’re halfway done. Your favorite sliced veggies just got a whole yummier and a whole lot cheesier! If it’s not good by itself, make it into a pie! This sun-inspired spinach filled pie will make any gathering a little brighter and much more delicious, and provides enough vegetable yumminess for everyone. And look how aesthetically pleasing it is! For a tangy, sugary twist on carrots, this recipe fulfills both your savory and sweet cravings. Put aside your peeled carrots for something that will satisfy everyone’s preferences. This side dish is perfect for getting your vegetables in, no matter their age. Trade in your unhealthy potato chips for a new chip in town–the sweet potato chip! These are easy to make, have few ingredients, and are healthy! Put down your Lays and Ruffles for something much more satisfying to your taste buds. If you don’t want to eat your veggies, drink them. This smoothie is sweet and filling, but is filled with veggies to keep you on your dietary track. And it’s perfect for busy days on-the-go when you still need to get your vegetables in! Cauliflower is good by itself, but with some crunch it is amazing. Add some bread crumbs and seasoning, and discover how good cauliflower can get. Don’t forget your dipping sauce! If you’re a big Asian-inspired food fan, look no further. With a little sesame and garlic, you’ll quickly turn green beans into everyone’s favorite. This green bean recipe takes an Asian turn that will make your taste buds celebrate! 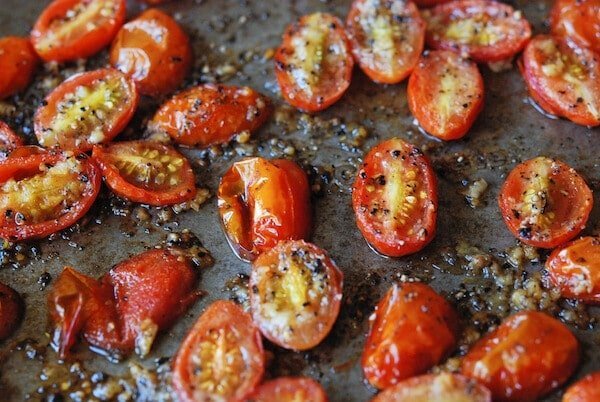 Give those tiny tomatoes a little twist with some roasting and a splash of garlic! The contrast of the sweetness of cherry tomatoes and the bitter of the garlic will be a real hit! Getting your recommended servings of vegetables doesn’t have to be a chore. With these delicious recipes you’ll actually look forward to getting your daily dose in. You might even eat more than you should! Play around with your ingredients and see what amazing vegetable creations you can come up with.